This morning, in front of a crowd of 2500 people, New Japan held WRESTLING HINOKUNI: A special event that served as much more than a regular New Japan “Road To…” show. Headlined by Togi Makabe’s rematch for the NEVER Championship that he never truly lost, Wrestling Hinokuni was a fun show overall with some exciting elements for longtime fans. I quite like the build to Nakamura vs Goto, as well. Nakamura brings the funny when he can’t see Goto, and completely ignores him. It won’t be quite so funny when Goto takes Nakamura to the limit at Dontaku, but I await anxiously for that match. 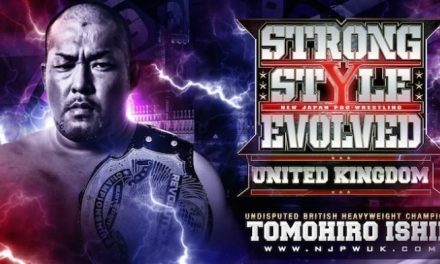 NEVER Openweight Championship – Tomohiro Ishii (c) vs Togi Makabe: I’ll mostly let some of @SenorLARIATO’s GIFs tell the story of this one. If you’re a previous viewer of NJPW, following the NEVER title throughout 2014-2015, you know what happened here. Ishii and Makabe beat eachother up for twenty five minutes until one of them just couldn’t go anymore. That person was Tomohiro Ishii, who drops the NEVER Openweight Title to Togi Makabe for the second time this year. STR 63: WWE Raw is Weather, NXT TV, plus your questions!